This particular story, Candidates Forum, is an excerpt from the next Carding novel, The Dazzling Uncertainty of Life, which will debut in this space on April 7. Stay tuned for details. 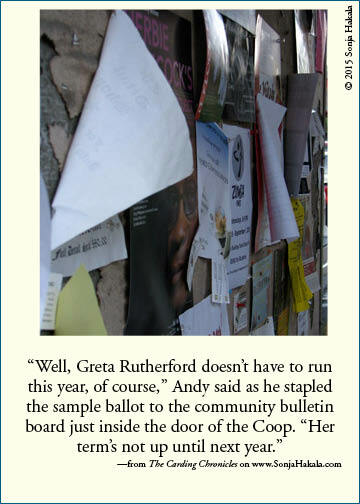 “But I thought that what’s her face, Pat Evans, was going to run this time,” Ruth Goodwin said, crowding in to look at the candidates’ list. “Yeah? When did he do that?” Amos asked, reeling his neck back into his scarf, and securing his jacket’s top button. “But that doesn’t make him qualified to be on our school board,” Edie said. “Would you have run?” Andy asked. Ruth nodded. “I always thought you were a sensible man, Stephen.” Everyone grinned. Ruth was Maxwell Goodwin’s first wife, the one who got the biggest alimony payment, as she liked to say. The crowd, now numbering a dozen, bent over as a single unit to read the two words that had shocked Edie. “Is there anyone running against him?” Charlie asked. Several stunned faces turned in Gideon Brown’s direction. His father, Harry, had put a lot of effort into making himself disliked in Carding, and he had succeeded. A thick blanket of silence rolled over the gathering, and Gideon fidgeted, uncertain how much more to say. He wasn’t crazy about his father either. Everyone else’s mouth twitched as they bowed their heads to take in the man’s shorts and well-worn boots. Summer or winter, Amos Handy saw no reason to ever change his wardrobe. Amos was Carding’s self-selected eccentric. “Can’t we do nominations from the floor to stop these folks?” Amos’s voice squeaked. “You can say that again,” a voice boomed. Everyone started. Gideon tried to hide from his father’s gaze but Harry had already seen his eldest son. “But…” Charlie began but Edie shook her head. Being Harry’s ex-wife, she knew that opposing Harry with common sense was useless. Harry’s grin grew wider. “See ya at the polls,” he said as he turned away. The next Carding Chronicle will be published on February 19. If you are enjoying these stories (they’re a great break from politics, eh?) please encourage your friends to subscribe.